Yes - I should have given the dimensions of the Partridge (below). It is 4.5 x 2" - quite a tiny thing but big enough with all the detail. If any of you are part of the SSNW exchange, then you will be receiving one before too long. New Year bekons and O is organising a party for his friends. Leaving J and I to organise what WE will do while all the jollification is going on and to rustle up enougfh beds for those who cannot make it home. Good news - the studio is all swept out and clean - finally! I ought to post a new photo while it looks good.I installed J's Christmas present to me, a stereo system, and have piled up a bunch of CDs to cheer me through the engraving days and printing nights. Perhaps I will spend New Year's Eve there? With Love to you all and very best wishes for 2006. 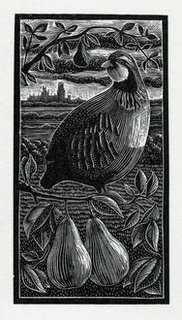 Here is an engraving that I made for a seasonal project. I was pleased with the results. In the background, you can see the unmistakable profile of the medieval cathedral of Ely, viewed across the fields, pretty much as one sees it from our house. J and I attended the midnight service at the cathedral on Christmas Eve and it was a magical and timeless setting to hear some wonderful singing. Seasons greetings to you all! I left the ink, press and paper last night and drove a short distance to hear Robert Fripp play Soundscapes in Sutton church. I arrived in time to sit and sketch, which always separates me from the relentless onslaught of life. RF was introduced and he seated himself on a stool surrounded by sound equipment, pedals and two beautiful Les Paul guitars - always my favourite shape. He started in silence, looking up and around the people who had gathered for the celebration with a charming smile that engaged everyone and drew them in. I realised that if one were to score the performance, it would have to start with several bars of silence and smiling. Knowing what was to come next, I watched faces around me as the sounds started to grow; I loved the looks of delight and wonder as this man with the smile of a sage coaxed unbelievable music from his guitar. I love music in a sacred space and wondered what preparation had gone into making a soundscape that involved the building, occasion, listeners and musician so completely. It was an intensely moving performance that carried me away from the pressures of life and the aches of my age. Inside me, a slim young man with a mass of hair was sitting cross-legged in a concert hall. Around me, music became stone, wood and glass. It swept through the building in waves and subsided into bells. I sat in quiet meditation for some time after the final notes had died away. After the improvisations had finished and RF had walked out into the Fenland night. I drove home, walked to the studio and carried on printing the front of our Christmas cards. I kept my positive mood alive by playing "Love Cannot Bear" (live soundscapes) rather loud and filling a large mug with tea. As the music surrounded me I performed the slow and repetitive ballet that is printing on a Victorian iron handpress. I worked until midnight, cleaned up the ink, locked the studio door and walked towards the house in a tired but very satisfied daze. A few days earlier, I had been asked if I had a blank engraved bookplate for a book to be presented to mark the occasion. I had nothing suitable and so I sat down and drew something. With so much work to do, it was immensely enjoyable to stop and sit down for a few minutes to do this just for the sheer pleasure of drawing; to do something spontaneously simply because I wanted to. It seemed to be a very luxurious act.